Sun Poker is proud to announce the release of its No-Download poker client. (See Below press release) This means players can enjoy SunPoker.com on ANY computer that has Internet access. This also means players can now play on a MAC or Linux systems, in addition to Window’s based computers. 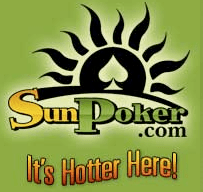 Players can visit SunPoker.com today and click on “Play Instantly”, and within seconds, they will see the poker lobby right in their browser window.